writings of Lysias, Isocrates, and and doubted, therefore, whether Mr.
Isæsus; the second on Demosthenes Mores had written any other, and Dinarchus; but in both these | aronum mores, ritus, atque aedificia Seculi, praecipue deeirni, illustranda in lucem editae. Anno Domini MDCCLIV." The plates, which were purchased by Mr. Gough, are now in the Bodleian library. In 1752 he was elected F. S. A. and two years after was one of a committee for examining the minute-books of that society, with a view to selecting thence papers proper for publication*. Being intended for orders by his father, he took the degrees of B. A. May 12, 1750, and M. A.Jan. 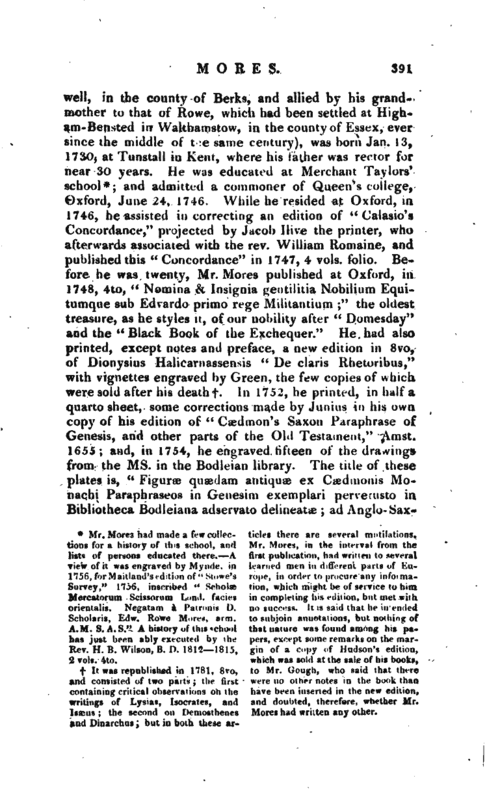 15, 1753; before which time he had formed considerable collections relative to the antiquities, &c. of Oxford, and particularly to those of his own college, whose archives he arranged, and made large extracts from, with a view to its history. He was at the expence of three plates of the Black Prince’s apartments there, since pulled down, which were drawn and engraved by that very ingenious artist B. Green. Twenty-eight drawings at his expence, by the same hand, of ancient gates, halls, &c. since ruined or taken down, were purchased by Mr. Gough, as also some collections for a “History of Godstow Nunnery,” by Mr. Mores, for which a plate of its ruins was engraved, and another of Iffley church. His Mss. 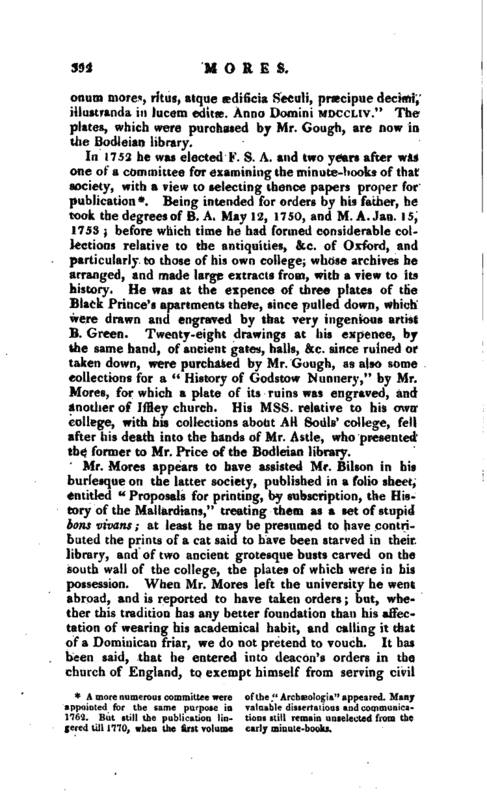 relative to his own college, with his collections about All Souls’ college, fell after his death into the hands of Mr. Astle, who presented the former to Mr. Price of the Bodleian library. gered till 1770, when the first volume early minute-books, | offices; but it does not appear that he received ordination from the bishop of London. Thus much, however, is certain-, that in the letters of administration granted to his son, on his dying intestate, he is styled “the Reverend Edward-Rowe Mores, doctor in divinity,” but, at what time, or by which of the bishops, he received ordination, we have not yet discovered. Mr. Nichols was assured by a very intimate friend of Mr. Mores, that he received the honorary title of D. D. in consequence of a literary favour which he had conferred on some foreign Roman catholic ecclesiastics, who wished to repay him by a pecuniary acknowledgment, which he politely declined accepting. Mr. Mores was as ambitious of singularity in religion as in other pursuits and if he could.be said to be a member of any particular church, it was that of Erasmus, whom he endeavoured to imitate. He thought the Latin language peculiarly adapted to devotion, and wished, for the sake of unity, that it was universally in use. He composed a creed in it, with a kind of mass on the death of his wife, of which he printed a few copies, in his own house, under the disguised title of“Ordinale Quotidianum, 1685. Ordo Tngintalis.” Of his daughter’s education he was particularly careful. From her earliest infancy he talked to her principally in Latin. She was sent to Rouen, for education, but without the least view to her being a Roman catholic: on the contrary, he was much displeased when he found she had been perverted. 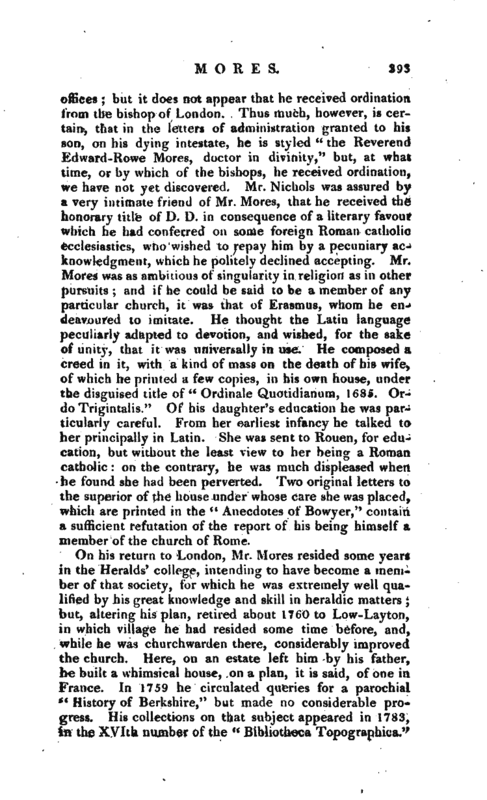 Two original letters to the superior of the house under whose care she was placed, which are printed in the “Anecdotes of Bowyer,” contain a sufficient refutation of the report of his being himself a member of the church of Rome. On his return to 'London, Mr. Mores resided some years in the Heralds’ college, intending to have become a member of that society, for which he was extremely well qualified by his great knowledge and skill in heraldic matters; but, altering his plan, retired about 1760 to Low-Layton, in which village he had resided some time before, and, while he was churchwarden there, considerably improved the church. Here, on an estate left him by his father, he built a whimsical house, on a plan, it is said, of one in France. In 1759 he circulated queries for a parochial “History of Berkshire,” but made no considerable progress. 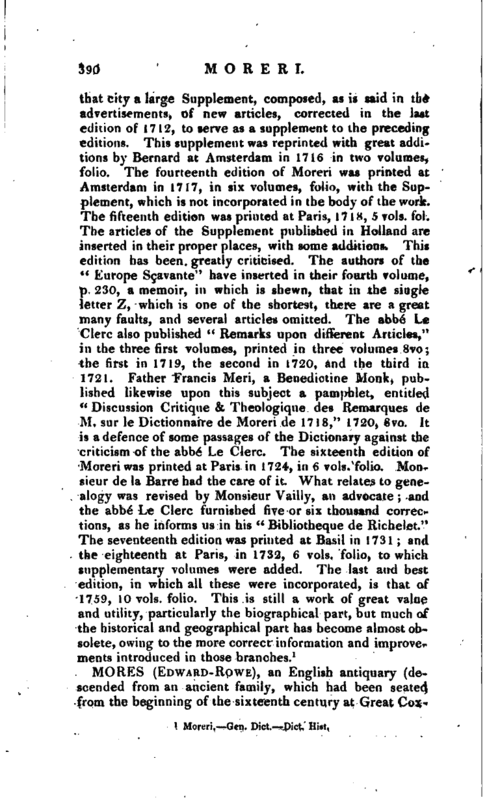 His collections on that subject appeared in 1783, in the XVIth number of the “Bibliotheca Topographica.” | The Equitable Society for assurance on lives and survivorship by annuities of 1 Oo/. increasing to the survivors, in six classes of ages from 1 to 10 10 to 20 20 to 30 3O to 40 40 to 50 50 to the extremity of life, owes its existence to Mr. Mores. It had been first suggested and recommended in lectures, in 1756, by Mr. James Dodson, mathematical master at Christ’s hospital, and author of the “Mathematical Repository,” who had been refused admission into the Amicable Society on account of his age; but he dying November 23, 1757, before his design was completed, except the plan of reimbursement to him and his fifty-four associates, Mr. 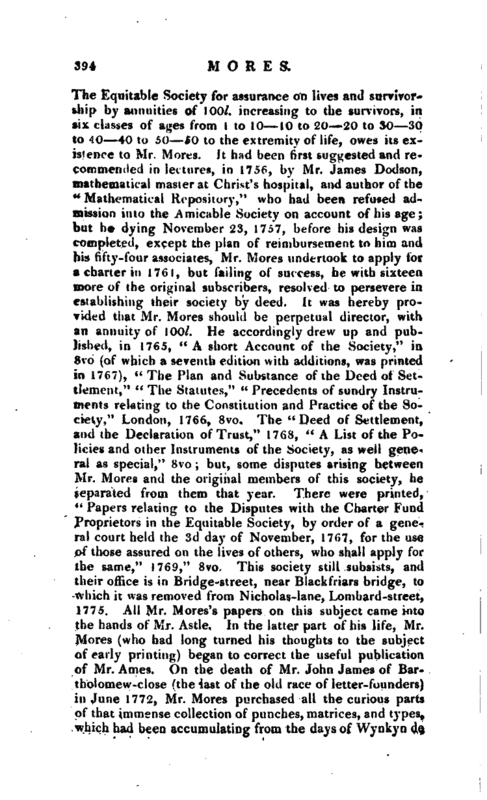 Mores undertook to apply for a charter in 1761, but failing of success, he with sixteen more of the original subscribers, resolved to persevere in establishing their society by deed. It was hereby proTided that Mr. Mores should be perpetual director, with an annuity of 1GO/. He accordingly drew up and published, in 1765, “A short Account of the Society,” in 8vo (of which a seventh edition with additions, was printed in 1767), “The Plan and Substance of the Deed of Settlement,” “The Statutes, 11” Precedents of sundry Instruments relating to the Constitution and Practice of the Society,“London, 1766, 8vo. The” Deed of Settlement, and the Declaration of Trust,“1768,” A List of the Policies and other Instruments of the Society, as well general as special,“8vo; but, some disputes arising between Mr. Mores and the original members of this society, he separated from them that year. There were printed,” Papers relating to the Disputes with the Charter Fund Proprietors in the Equitable Society, by order of a general court held the 3d day of November, 1767, for the use of those assured on the lives of others, who shall apply for the same,“1769,” 8vo, This society still subsists, and their office is in Bridge-street, near Blackfriars bridge, to which it was removed from Nicholas-lane, Lombard-street, 1775. All Mr. Mores’s papers on this subject came into the hands of Mr. Astle. In the latter part of his life, Mr. 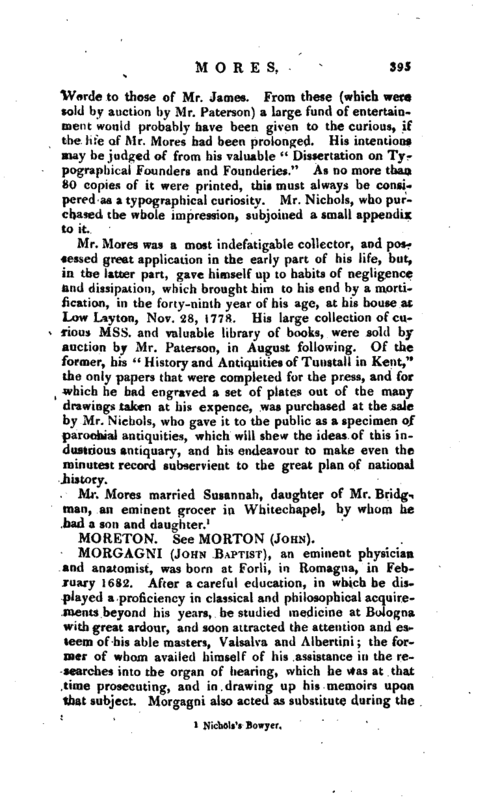 Mores (who had long turned his thoughts to the subject of early printing) began to correct the useful publication of Mr. Ames. On the death of Mr. John James of Bartholomew-close (the last of the old race of letter-founders) in June 1772, Mr. Mores purchased all the curious parts of that immense collection of punches, matrices, and types, which had been accumulating from the days of Wynkyn de | Worde to those of Mr. James. From these (which were sold by auction by Mr. Paterson) a large fund of entertainment would probably have been given to the curious, if the life of Mr. Mores had been prolonged. His intentions may be judged of from his valuable “Dissertation on Typographical Founders and Founderies.” As no more than 80 copies of it were printed, this must always be considered as a typographical curiosity. Mr. Nichols, who purchased the whole impression, subjoined a small appendix to it. Mr. Mores was a most indefatigable collector, and pos sessed great application in the early part of his life, but, in the latter part, gave himself up to habits of negligence and dissipation, which brought him to his end by a mortification, in the forty-ninth year of his age, at his house at Low Layton, Nov. 28, 1778. His large collection of curious Mss. and valuable library of books, were sold by auction by Mr. Paterson, in August following. Of te former, his “History and Antiquities of Tuiistall in Kent” the only papers that were completed for the press, and for which he had engraved a set of plates out of the many drawings taken at his expence, was purchased at the site by Mr. Nichols, who gave it to the public as a specimen of parochial antiquities, which will shew the ideas of this industrious antiquary, and his endeavour to make even he minutest record subservient to the great plan of national history.